A cup of Starbucks hot chocolate is a comforting treat in cold weather. While the drink won't ruin your diet, it's still best to consume in moderation. The nutrition information provided by LIVESTRONG's food database MyPlate shows that one envelope of hot chocolate mix contains 120 calories; 1.5 grams of fat, one gram of which is saturated; 31 grams of carbohydrates; two grams of fiber; 27 grams of sugar; and two grams of protein. Different flavors have slight differences in nutrition. The Starbucks Double Chocolate Hot Cocoa Mix, for example, contains 120 calories; 2.5 grams of fat and 1.5 grams of saturated fat; 22 grams of carbohydrates; three grams of fiber; 17 grams of sugar; and two grams of protein. You will up your fat and sugar intake some if you choose Starbucks Salted Caramel Hot Cocoa Mix instead, with 120 calories; 3.5 grams of fat and 2.5 grams of saturated fat; 22 grams of carbohydrates; two grams of fiber; 18 grams of sugar; and two grams of protein. If you're looking to up the protein content of your hot chocolate and have some calories to spare, you can use milk instead of water. According to MyPlate, one cup of whole milk will add just over seven grams of protein to your drink (along with 149 calories and almost eight grams of fat). One cup of two percent milk will add eight grams of protein (along with 122 calories and almost five grams of fat); and one cup of skim milk will add eight grams of protein (along with 83 calories and 0.2 grams of fat). The Starbucks powdered hot chocolate mix is still a less caloric choice than going to a Starbucks and ordering a hot chocolate from a barista. A Grande hot chocolate at Starbucks will set you back 400 calories, with 16 grams of fat and 10 grams of saturated fat; 50 grams of carbohydrates; four grams of fiber; 43 grams of sugar; and 14 grams of protein. 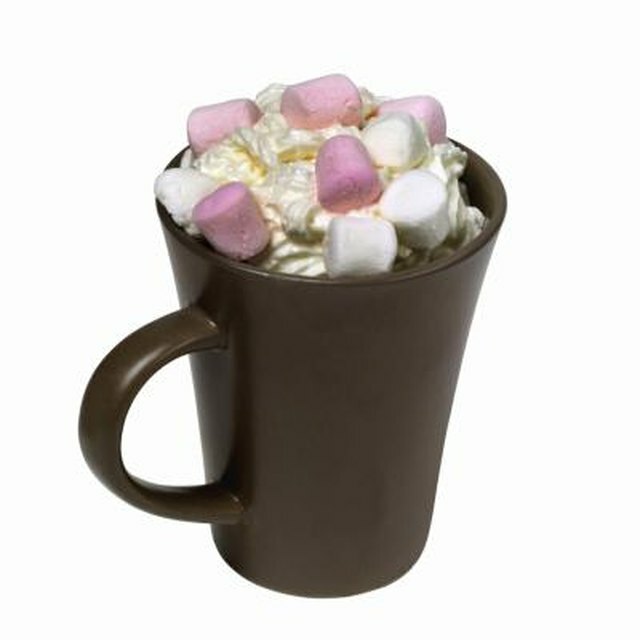 A large portion of the calories in Starbucks hot chocolate come from sugars. Added sugars, like those in hot chocolate, provide calories but little nutritional value. Consuming too many foods with added sugar may lead to tooth decay, weight gain and increased triglycerides, which increase your risk of heart disease, according to MayoClinic.com.